Do yuo recognise this man? Police have issued CCTV images following a suspected racial attack in central Milton Keynes on New Year’s Day. The victims, a 45-year-old man and a 28-year-old man, of Indian origin, were in the car park of Xscape at about 8pm, when they were followed by a group of white men, believed to be of Eastern European origin. The group started shouting at the victims in a foreign language before shouting ‘go back’ in English. The offenders then assaulted the victims by pushing, punching and kicking them, and they sustained minor head and leg injuries. Investigating officer, PC Edward Baker said: “This is not only a violent offence but we believe it was motivated by racial discrimination which will not be tolerated in the Thames Valley. 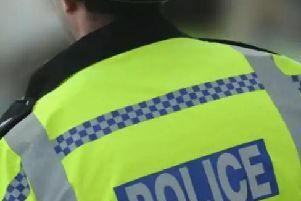 “The offenders left the Xscape car park in a black SUV style vehicle which was followed by a white saloon car, it is not known whether the white saloon vehicle is connected to the offenders. Do you remember seeing this man at Xscape? “It is believed the offenders had attended McDonald’s restaurant in Xscape before the offence. “Anyone who witnessed the assault, saw the offenders in McDonald’s before the offence or has any other information about the incident is urged to contact police as soon as possible.